Newcastle's only National Trust listed building, Miss Porter's House provides the basis for Helene Leane's first solo exhibition, Lino & Lace at Gallery 139. Inspired by the design and use of linoleum floor covering offset by lace as an effeminate decoration after visiting the house in 2014, the artist has since delved into the house's history. It was built in 1909 and was occupied by the Porter Family for over 90 years before it was bequeathed to the National Trust of Australia (NSW) in 1997. The house is a beautiful example of original Edwardian era with stencilled timber ceilings, linoleum and all historical art deco light fittings. It remains the sole residential building in an area that has slowly given way to changes of an evolving commercial city. With this exhibition, Helene Leane will draw the audience back in time where lino and lace were an integral part in every household. Lino, so useful and practical, didn't seem to be a throw-away object 100 years ago, it was often left on the floor, even if carpet was laid over top. It was also used to line shelves, cupboards and pantries because of its functionality and variety of patterns – some beautiful others garish – that it came in. 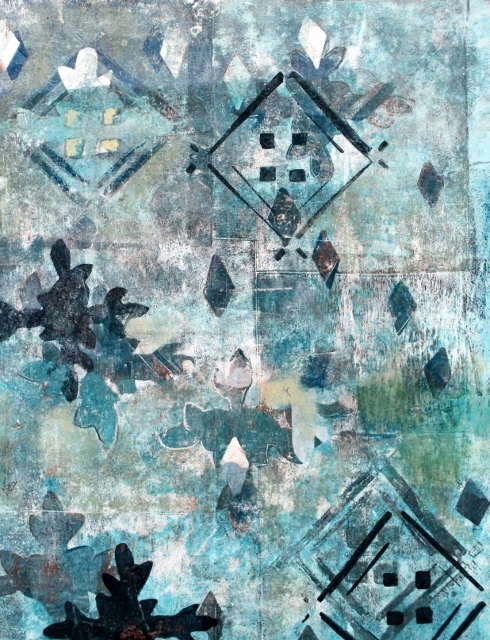 Helene has translated the historical patterns of the lino into a series of framed contemporary gouache monotypes, a printmaking process, that mimic the aged floor covering and pay homage to the tones and colours found in Miss Porter's House. These monotype prints have been further extended into acrylic on canvas paintings that delve deeper into the lino pattern formation. Lace is a decorative material and reflective of a female presence in most Edwardian homes. Lace fabric was kept for future loved ones, used as feature on important clothes or placed between objects and precious furniture. In Lino & Lace, lace doilies are soaked in paint and transferred to the canvas to create delicate images of the lace pattern. They are further manipulated by a photo-transfer process to create bright lace patterns far from the original colour and tone of the fabric. This exhibition is a small example of the work this artist can produce and will showcase to audiences Gallery 139's commitment to supporting Helene's overall development as an artist. HELENE Leane's recent work uses patterning and motifs from Miss Porter's House and its trove of well-loved domesticity. 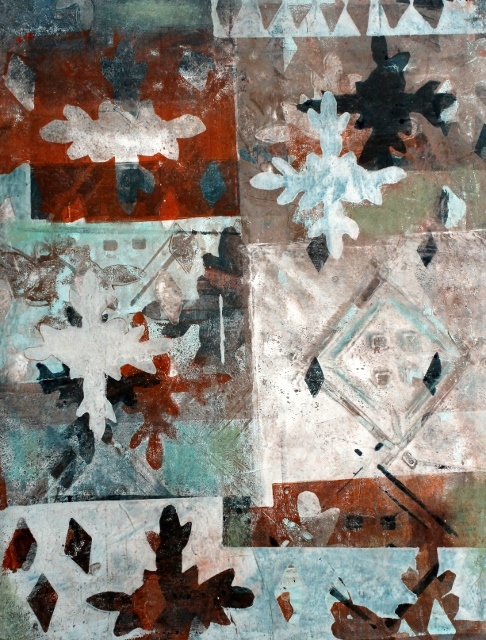 Old lino inspires many works, dominating misty monotypes. Lace medallions are impressed into encaustic. The old house provides rich themes for artists and this is a well-focused exhibition, on view until June 20, from one of the initial group of artists to be specially promoted by Gallery 139.